LOS ANGELES, CA, USA, April 1, 2019 /EINPresswire.com/ -- For the last thirty-five years, The RAZ Band has been recording and performing their own brand of original songs, entertaining audiences across the US and globally. 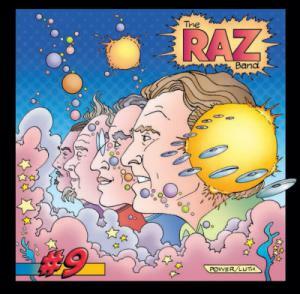 The RAZ Band members are Michael 'Raz' Rescigno on guitar & vocals, Jeff 'Hutch' Hutchinson on drums & vocals, Jim Manzo on bass & vocals, and Joey Molland on guitar vocals & production. In November of 2015 Gonzo Multimedia released The RAZ Band's award-winning album “Madison Park”. Madison Park won the 2015 Album of the year award by Roadie Crew magazine editor Airton Diniz. In May of 2016 Gonzo released “The Best of RAZ 1984-2015”; both albums received rave reviews around the world.